Since we all know that the Black Goose Cafe serves some of the best gourmet sandwiches in the area, it should come as no surprise to our readers that Mom and I often order lunch to go - especially since I've been unemployed and readily available to drive to Tiverton at any given moment. 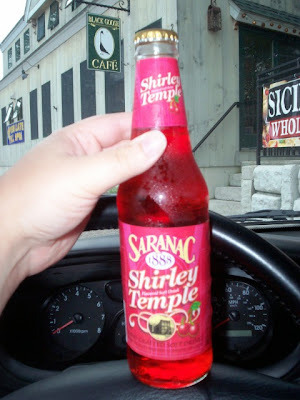 While picking up our sandwiches on Friday, I spotted a bottle of Saranac Shirley Temple Flavored Soft Drink in the beverage cooler. I haven't had a Shirley Temple in almost 20 years, and I remember loving the taste, so I decided to buy one. However, I told Mom that I would bring home iced coffees from Dunkin' Donuts, so I was in quite a bind. Do I buy the soft drink and get an iced coffee? Is that stupid? No. What's stupid is leaving the bottle there, drinking the iced coffee, and kicking myself for not having bought the drink for our Bite of the Week. Needless to say, I returned the next day to pick up a bottle of Shirley ($2). THE VERDICT: Fruity and nostalgic. The only thing that was missing was the glass, the umbrella, and that tiny toothpick with the cherry and the orange slice stuck through it. Oh, and I would have probably been sitting at the old China Royal restaurant with my parents. Drinking this was like walking down memory lane. My uncle Roland bought my cousin Jennifer and I a Shirley Temple once at a party, and since I'd never had one before, I treated it like I was drinking a glass of Chardonnay. Since Jen was a pro, I copied her as she delicately sipped the pink drink through that skinny straw with her pinky up. What a class act! After my sister was born, we got her hooked on the stuff as well. I don't know if parents know this or not, but giving a little girl a Shirley Temple instead of a soda or a glass of milk is like finally acknowledging that she is a young woman. It's all very sophisticated. As for the drink itself, I found it extremely sugary (that probably has something to do with the 45 grams of sugar they used to make it). What bothers me is the fact that I even looked at the nutrition facts on the label. Doing this sent me back to reality - kids don't care about all the sugar. Thirty year old women do. Yikes!! At least I got to relive my childhood for a brief moment. Thanks, Black Goose!